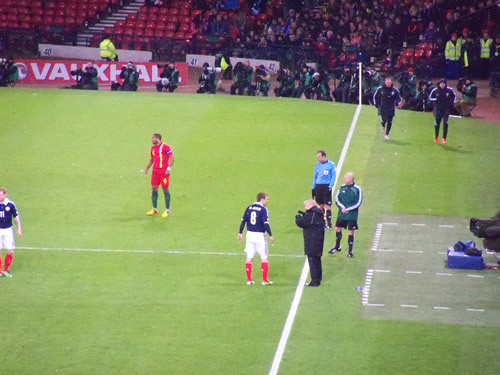 If you have been following this blog to almost stalkerish levels (or – more than likely – I told you), you may be aware of a few posts missing, but probably the biggest one being Bulgaria away at the tail end of Wales’ campaign to qualify for Euro 2012. Well the truth is I flew out to Bulgaria, but after getting scammed in a bar, I had to head back to Bulgaria a day early, missing the game. As such, I hadn’t been to a Wales away game for ages, but was still keen to go to more games. As such when the draw was made (a draw I watched in my mate’s floozy at the time’s house in Wythenshawe), one game piqued my interest more than any other. Immediately with gusto, I texted my Glaswegian mates to inform them of the game and I was heading up to see them on a random day in March 2013. Being summer 2011, they said I was mad, and get the Olympics out of the way before even planning. Sadly, my extreme pre match enthusiasm petered out, and I was left just to go on my own to Hampden Park, but although I was on my own, I was not alone. The day of the game arrived and I woke up with absolutely zero hangover. The night before I attended a pre-match party in a pub in The Iron Horse, the Glasgow home of the Tartan Army. Much fun was head sharing pints and stories and away trips with the Scottish fans (which included a bunch of German fans), so to wake up non hungover was a pleasant surprise. After a wee bit of culture in Glasgow (which you can see results of here), exploring the city and seeing the cathedral, I headed to the warm confines of my hotel to get ready for the game. It should be said – and not forgotten – that the weather was absolutely Baltic. I knew Scotland would be colder than Manchester, but it was absolutely freezing, and there was some doubt that the game would be called off, along with my games the next days – Rangers vs Stirling Albion and Partick Thistle vs Livingston. Not so though, and the game went ahead. 3pm came and I headed to The Iron Horse for an afternoon of patriotic verbal jousting, but on the way to the ground I stumbled across a fellow Colwyn Bay fan, and we headed to another boozer for a few pints. The atmosphere in this pub was a lot more muted, but still good fun. I kind of thought that The Iron Horse would be louder and funner, so I tried to drag my fellow seagulls to this pub. I was successful, but upon arrival the pub was full! Disaster! After a pint in a pub across the road (where I felt so uncomfortable due to overly friendly Scots buying pints, and my mates abandoning me to try and get into the Iron Horse again), a successful foray into The Iron Horse, and then an overly unhealthy tea of grease and chips, I headed to the game. Hampden was a blizzard, but buzzing and after a friendly train journey and my desperate search for a match badge, which saw me buy three of the buggers, I entered Hampden Park. To say it was cold was a vast understatement. Rival fans were keeping themselves warm by singing songs to each other, but I preferred the more traditional way of a scolding hot tea. 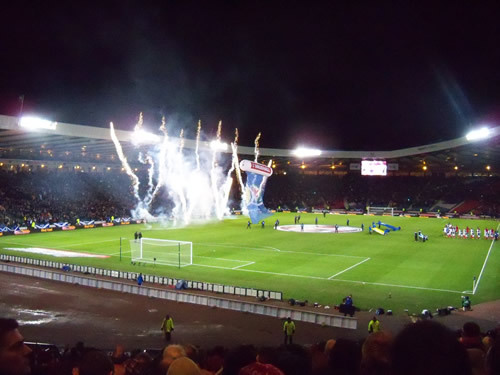 The teams arrived onto the pitch with an impressive level of pyrotechnics for teams bottom and second bottom in the World Cup Qualification group, and after the anthems (with the Scottish one sung by Amy MacDonald, bonus! I bloody love Amy MacDonald! ), the match begun. 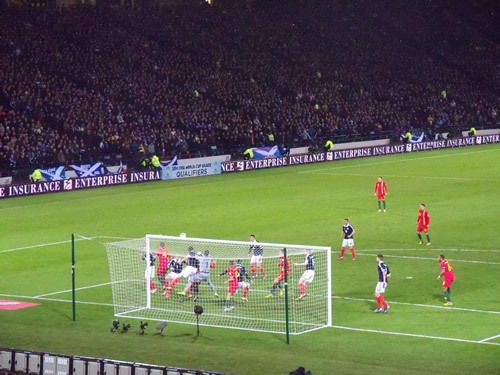 The goal sent Scotland fans into a frenzy, and were given a further cause to celebrate when Gareth Bale – Wales’ great hope – was withdrawn on half time for Jonathan Williams. At the time, baffling. In hindsight, a masterstroke. Scotland began the second half brighter, with a shot ricocheted off Boaz Myhill’s upright, but Wales pressed, and were denied an equaliser from Andy King when it was adjudged that the keeper was infringed in the build up. The game changed however on the 70th minute, when Chris Gunter was fouled in the box by Snodgrass, who received his marching orders, and Ramsay thundered in the equaliser off the bar, a penalty even now I still thought he missed. Three minutes later Wales took the lead, when a cross from Andy King found the head of Hal Robson-Kanu, who headed it beneath the keeper. Following the two quick goals, the atmosphere changed with the home fans, as there looked like no comeback for the Tartan Army. In truth, I think the fact that most of the fans both froze and sobered up, meant the atmosphere wasn’t quite as loud as the first half. Nevertheless, Scotland was given a chance where Arron Ramsay cynically brought down James McArthur when the latter was through on goal. However, the resultant free kick was blasted over, and Wales win for the first time with me in attendance. Scotland 1 – 2 Wales. After the game the queue to the station back to the city centre was large, and we queued for over an hour, everybody was in high spirits though, and many of the Welsh away supporters would say they’d join their new found compatriots in the Tartan Army in two more games, that followed the next day.